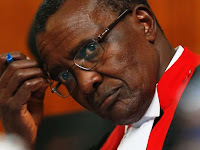 Wednesday September 5, 2018 - One senior Judge in the country is under investigations after she was linked to a syndicate printing counterfeit money involving criminals from Kenya and Ghana. On Saturday last week, detectives from the Directorate of Criminal Investigations arrested a Kenyan and a Ghanaian in Runda and linked the senior judge to counterfeit printing of cash and money laundering. The two were found in possession of fake currency amounting to $523,900, Sh500,000 genuine Kenyan currency, a Taurus pistol and several rounds of ammunition. The two said they work with the senior Judge and even showed the detectives phone conversations with the top Judge. “We are trying to ascertain the nature of this peculiar relationship and whether the judge could have been a victim or an accomplice to the cartel,” a detective who requested anonymity said. “If the judge was a victim, why was the matter allowed to go unreported, allowing the cartel to continue exploiting innocent Kenyans?” the detective asked. He also revealed that the Judge has been in a sexual relationship with these criminals for more than two years. Chief Justice David Maraga is not aware of the Judge’s criminal activities.